OVALLE, Chile, Aug 14 (IPS) - Eighteen national science prize-winners in Chile have called for a halt to the over-extraction of water in the four regions over which the Atacama Desert spreads in the north of the country, a problem that threatens the future of 1.5 million people. In their Tarapacá Manifest, which takes its name from one of the affected regions, the scientists call for water in the area to be treated as a non-renewable resource because mining companies, agriculture and large cities consume underground reservoirs of water that date back more than 10,000 years and are not replenished with equal speed. According to the experts, the current rate of water extraction for mining, agriculture, industry and cities "is not sustainable." Chile is the world's leading exporter of copper and of fruit and vegetables, two water-intensive sectors. 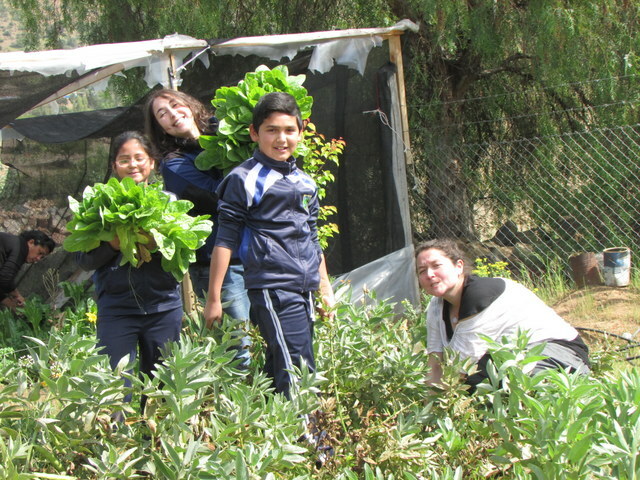 In the small rural school of El Llanito de Punitaqui, 400 km north of Santiago, teacher Marleny Rodríguez and her only four students installed gutters to collect rainwater in a 320-litre pond to irrigate a vegetable garden. "The children are happy. They tell me that we were losing a vital resource that we had at hand and were not using. They replicated what they learned at school at home," Rodríguez told IPS. The two girls and two boys, between the ages of six and 10, including three siblings, attend the tiny school in an area of ancestral lands of the Atacama indigenous people. "We have a year-round cycle. What we harvest we cook in the cooking workshop where we make healthy recipes. Then we eat them at school," said the teacher of the school in Punitaqui, near Ovalle, the capital of the Coquimbo region, on the southern border of the desert. "The children help to sow, clean the garden, harvest, and water the crops. We have a scientific workshop to harvest the greywater with which we irrigate a composter of organic waste and other materials such as leaves, branches and guano, used as fertiliser" she said. Calogero Santoro, an archaeologist and promoter of the Tarapacá Manifest, which was delivered to the government of President Sebastián Piñera on Jun. 29, believes that citizens and large companies do not have the same awareness as these children about water scarcity. "Private companies do not see this as a necessity, because they do not have any problem. On the contrary, the whole Chilean system is designed to make businesses operate as smoothly as possible, but the problem is just around the corner. It is the Chilean government that invests in scientific and technological research," he told IPS. The scientists' manifest calls for raising awareness about the serious problem of the lack of water, in-depth research into the issue, and investment in technologies that offer new solutions rather than only aggravating the exploitation of groundwater. "The first step is to generate cultural change. As awareness grows, other technological development processes are developed, new technologies are created and these are adapted to production processes," explained Santoro, of the government's Research Centre of Man in the Desert. "Unfortunately, the private sector in this country does not invest in this kind of things," he said. The Atacama Desert is the driest desert on earth. It covers 105,000 sq km, distributed along six regions of northern Chile and covering the cities of Arica, Iquique (the capital of Tarapacá), Antofagasta and Calama. It is home to 9.5 percent of the population of this long, narrow South American country of 17.5 million people. In a normal year, only between 1.6 to 2.5 mm of water fall on the regions of the so-called Norte Grande, which covers the Atacama Desert, and so far in 2018 the deficit is 100 percent in some of the cities and 50 percent in others, according to Chile's Meteorological Agency. Hugo Romero, winner of the national geography prize, and a professor at the University of Chile and president of the Chilean Society of Geographic Sciences, told IPS that "groundwater is today the most important source of water for both mining and urban development in the northern regions." That means the problem is very complex, he said, because "there is some evidence that much of the groundwater is the product of recharge probably thousands of years ago, and therefore is fossil water, which is non-renewable. As an example, Romero cited damage already caused in the desert area, "such as those that have occurred with the drying up of Lagunillas, and of the Huasco and the Coposa Salt Flats, adding up to an enormous amount of ecological effects." They also affect, he said, "the presence of communities in these places, given this close relationship between the availability of water resources and the ancestral occupation of the territories." "All of this is creating an extraordinarily complex system with respect to which there is a sensation that the country has not taken due note and decisions are often taken only with economic benefits in mind, which are otherwise concentrated in large companies," he added. Romero also warned that the level of research "has been minimal and, unfortunately, many of the academic resources that should be devoted to providing society and social actors with all the elements to reach decisions are committed to consulting firms that, in turn, are contracted by large companies." Claudio Latorre, an academic at the Catholic University of Chile and an associate researcher at the Institute of Ecology and Biodiversity, believes that "there is not just one single culprit" for the serious situation. "It is simply the general economic activity of the country that is causing this problem. The more activity, the more the country grows and the more resources are required, and the more industrial activity, the more work. But urban needs are also increasing and that also puts pressure on water resources," he said. "In the manifest we have proposed the possibility of improving our technology in the use of water harvested from fog. We also propose implementing a water recovery policy. For example, increasing the greywater system. It is not an expensive solution, but it requires a State policy," he explained. According to Calogero, "in addition to cultural changes, there have to be technological changes to make better use of water. We cite the case of Israel where it is our understanding that water is recycled up to seven times before it is disposed of. Here, it is recycled once, if at all." Latorre stressed that "we are already experiencing the consequences of climate change and over-exploitation of water resources that lead to an unthinkable situation...but in the Norte Grande area we still have time to take concrete actions that can save cities in 20 or 30 years' time." He called for improved access to scientific information "so that we can be on time to make important decisions that take a long time to implement." According to Romero, there is also "an atmosphere of uncertainty that has often led to decisions that have subsequently led to environmental damage" as in the case of many salt flats, bofedales (high Andean wetlands) and some lagoons and lakes. "There is no transparent public knowledge available to society as needed, given the critical nature of the system," he said. In his opinion, "on the contrary, the greatest and best information is of a reserved nature or forms part of industrial secrecy, which gives rise to much speculation, ambiguity and different interpretations by users or communities affected by the extraction of water." Romero also warned that "there is not only very significant ecological damage, but also a steady rural exodus to the cities, as the people leave the area." There are Quechua, Aymara, Koyas and Atacama communities - the native peoples of northern Chile - in the cities of Arica, Iquique, Alto Hospicio and Antofagasta as a result of their migration from their Andes highlands territories, he said. That's why only four students are now attending the rural school in El Llanito de Punitaqui, the teacher said.